To generate qualified leads for your sales teams, you must make sure your prospects are aware of your brand and products in order to attract them to your website and convert them into customers. Publishing advertising banners can be a good way to achieve this goal. An effective advertising banner is based on applying best practices that will help you to generate traffic and increase the visibility of your products. Advertising banners are an inexpensive way of generating leads. They can be put in place very easily and you can measure the results of almost instantly. Follow the 5 tips below to create an effective advertising banner. This is the first point you must address. All websites that publish advertising banners do not provide the same offer in terms of formats, so look into this beforehand. According to the messages that you want to publish, some formats will also be more suitable than others: for example, a square format will be more suitable for a visual communication while a horizontal banner will lend itself more to a text message. 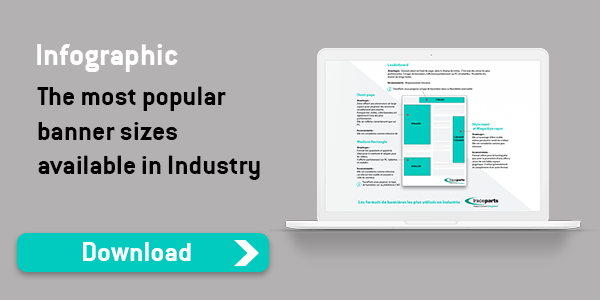 To help you make your choice, please do not hesitate to download the infographic on the most popular banner sizes available. Finally, you must think about the location of your banner on the page. If you want to maximize the banner’s visibility and impact on visitors to the website on which it is displayed, the banner must be above the fold and as close as possible to the main content. To create an effective banner in B2B, you must respect a certain balance when designing your banner. It is essential that your logo appears on the banner in order to identify your brand. It must be highlighted without being more visible than the call-to-action. On horizontal banners, the logo is usually positioned on the left in order to be the first element seen when reading. On vertical or square banners, it is positioned at the top. Visitors must be able to identify your brand at first glance. This is the offer, the product that you showcase on your banner. The message must be concise and impactful because you generally have little space to promote your offer. The words used must be carefully chosen and aimed at the target audience. Vary the font sizes, or the case, to highlight key words and avoid fonts that are too unusual or difficult to read. This part of the banner generally takes most space, approximately 60% of the banner. Remember to add images to illustrate your comments but only if these are attractive to your target. The call-to-action will close out your banner and encourage visitors to click to learn more. it will take them to a landing page where they fill out a form in order to be able to download a document or find out more about the offer or product. As with emailing, the call-to-action button must be very visible, it must stand out graphically from the rest of the banner and make people want to click. It should be located to the right of the banner for horizontal banners, or at the bottom for vertical or square formats. Most websites that display advertising banners support formats for animated banners. A banner with animation can be more appealing to your target because it catches the eye but if you choose this option, use it sparingly. One advantage is that this gives you extra space because you have several slides on the same banner. As you can see, making a banner takes thought and consideration. There are codes to respect so that the banner can be read and understood by everyone. Avoid overloading your banner graphically and with too much text. Visitors spend little time reading a banner. Keep in mind that the most effective banners are those that can be read quickly. In B2B, a sober format is often a good approach. To stand out, you do not need a flashy banner! Visitors need to see at a glance how they will benefit from clicking on the banner. Advertisers often make the same mistake: they do not renew their advertising banners often enough. When a banner has been online for a moment on the same site, Internet users do not pay attention any more. If they have not clicked after several displays, they will not click next month either! Give yourself every chance and renew your banners regularly! If you want to use banners to promote several ranges of different products for example, think about using templates that you can easily apply to all the ranges. You will save time and the uniformity of your banners will allow visitors to identify your brand. Finally, if you use several formats of banner, think about giving your messages and graphics a uniform feel across the different formats. As when launching any advertising campaign, you must first define the objectives of your banner advertising campaign. In the case of lead generation, the main aim is to gather contacts: so, you will need to analyze the click rate, CPL (Cost per Lead), the CAC (customer acquisition cost) etc. The sites on which you publish your banners will be able to provide you with detailed statistics about your banners. Also remember to put in place of tracking links that will enable you to measure the impact of your banners on your side. As you can see, creating an effective advertising banner involves taking several best practices into account, like when designing an HTML template for an emailing campaign. One last piece of advice: put yourself in your prospects’ shoes, (i.e. the visitors to the site on which your banner will be displayed). It is by taking a step back and analyzing what your prospects are looking for that you will be able to convert them into leads and customers! TraceParts can help you launch your advertising banners campaign; do not hesitate to contact one of our experts to discuss the subject!